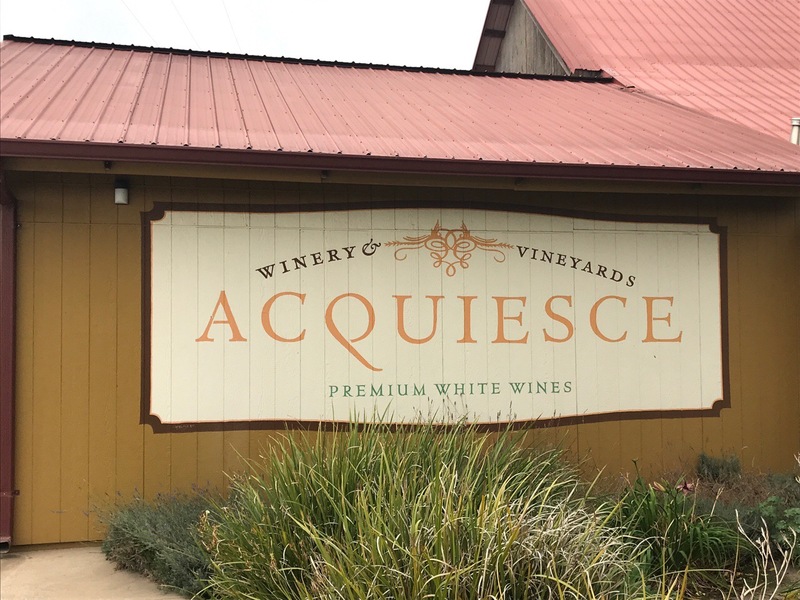 We visited Acquiesce Winery & Vineyards during the 2016 Wine Bloggers Conference in Lodi, CA. Fellow bloggers recommended it and since we’re big fans for Rhône Valley style wines we had to go. We thoroughly enjoyed everything we tasted. For more on that trip go here: Lodi Adventures after 2016 Wine Bloggers Conference. Since we were returning to California for the 2017 Wine Bloggers Conference, we decided to allow for some time in Lodi again. We emailed Sue Tipton, the owner of Acquiesce, to see if she would be willing to let us come in for a tasting. Acquiesce is normally closed on Wednesdays, but Sue graciously agreed. We arrived just before 11am. Before going in we took a look around the vineyards closest to the road. Below are some of the pictures we took. Sue grows only Rhône Valley white varietals and Grenache for making rosé. This is because Sue only makes white wines and a rosé. She ripped out Zinfandel, Lodi’s signature grape, to plant these Rhône Valley grapes! Also, Sue is small production. She opens for the year in March and is usually sold out of the previous year’s vintage by early to mid-November. Sue is now closed for the season and will reopen in March, 2018. 2016 Grenache Blanc – This wine had notes of green apple, apricot, and lime on the nose. On the palate, it had a crisp, minerally undertone with good apricot fruit. The finish was slightly minerally too. Sue paired this with a thyme cracker which provided perfect balance with the wine. 2016 Belle Blanc – A blend of 45% Grenache Blanc, 45% Roussanne, and 10% Viognier, light pear showed on the nose. Mildly ripe pear with some light mineral notes showed on the palate. Sue paired this wine with a manchego with a violet flower confit. This brought out the mineral notes in the wine along with a lightly floral undertone. 2016 Roussanne – A nose of honey and pineapple lead to a palate also of honey and pear. 2016 Viognier – This wine presented a floral peach note on the nose. Peach and apricot predominated on the palate along with a slight mineral undertone. Its pairing was a Moroccan spiced cracker with a mango chutney. 2016 Grenache Rosé – Picked at 22.5 Brix and whole cluster pressed, this showed light strawberry on the nose. Watermelon and lime showed on the palate. After we finished the tasting, Sue took us out to the winery. A fairly new building, it was filled with several tanks of various sizes. But unlike most wineries, there were no barrels. Sue’s wines are only done is stainless steel. She had a few more things for us to taste. 2017 Picpoul Blanc – We tasted this straight from the tank. While not the finished product, this will be a great wine. It was highly acidic with notes of pineapple and pear. 2017 Bourboulenc – Sue said we were some of the first folks in the country to taste an American grown Bourboulenc. Again, this wine will be great. It had notes of pear with some light pineapple in the background. Sue has the only known planting of this grape in the US. 2017 Clairette Blanche – A floral nose along with notes of pear showed on the nose. There was more pear on the palate along with some herbal notes. Again, it was an interesting wine. We look forward to tasting these wines again in their finished state. We headed back to the tasting room and selected wines for shipping home to us. We thanked Sue for taking the time to host us, and we know we’ll be back to see her. If you’re ever in Lodi, you should do the same!